It is best to treat nests at night or early morning when bees and wasps are less active. One treatment will be usually be sufficient, but a second treatment may be necessary a few days later. Control should be undertaken only after completing specialized training. A full bee suite made of heavy-grade material should be worn and carefully sealed at all possible access points. 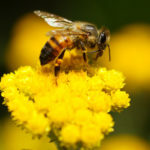 Care should be taken before insecticide application is made to be sure all residents, neighbors, and onloookers, who might be considered as a threat, are out of the area or safely indoors. The possibility of the undesirable after-effects of odor or staining, from the melting wax and honey and rotting bees. The nest and the honey needs to be removed and the entrance hole(s) sealed.